The Board of County Commissioners declares Dec. 5 as Grand Valley Gives Day in Mesa County. The Grand Valley Gives Collaboration was formed in 2012 on the Western Slope to increase awareness of giving back to the local community as part of the statewide movement of Colorado Gives Day. This year, 33 non-profit agencies are working together to raise funds to ensure local nonprofits can continue to provide valuable services to residents. Mesa County Commissioners unanimously approved a $165,623,590 county budget in public hearing Monday. For more information on the 2018 budget, visit https://www.mesacounty.us/finance/2018-budget.aspx. Also, the public-safety sales tax will start Jan. 1, 2018, learn more at http://blog.mesacounty.us/2017/12/public-safety-sales-tax-to-start-jan-1.html. 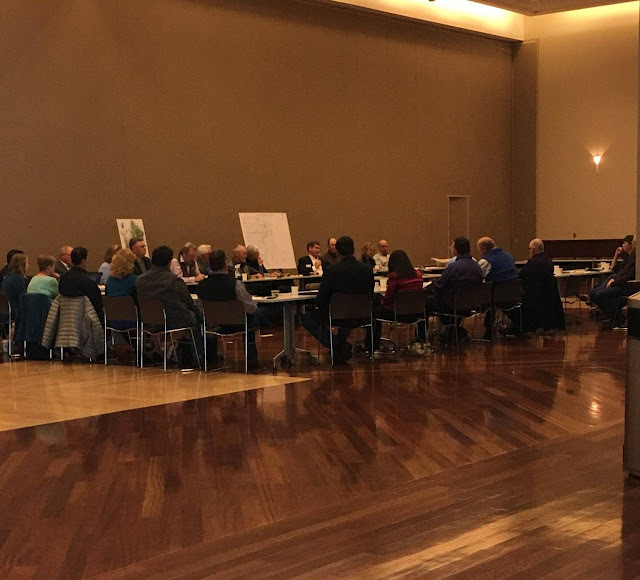 The Board of County Commissioners convened on Tuesday to vote on land-use items. To see what they voted on, visit http://sire.mesacounty.us/sirepub/mtgviewer.aspx?meetid=317&doctype=AGENDA. After residents testify before the Board of County Commissioners at a Land Use hearing Tuesday morning, Mesa County Planning staff Linda Dannenberger and Jeff Hoffman give the board recommendations on how to move forward. 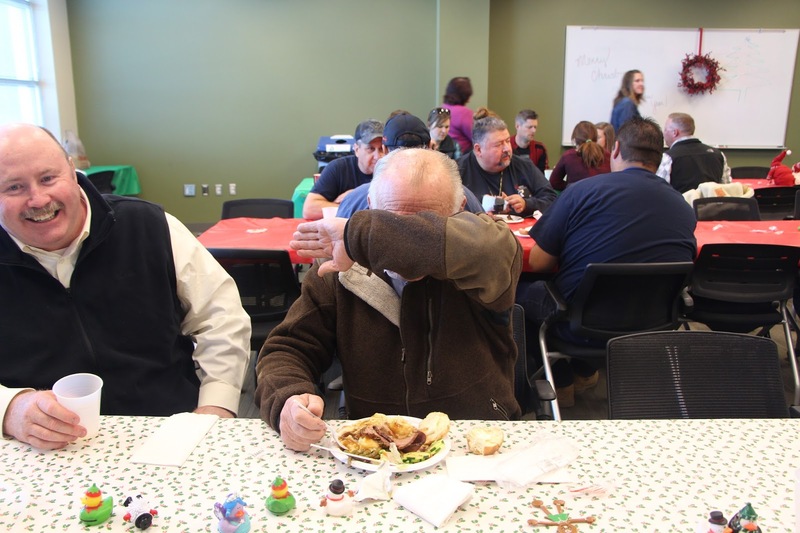 The Mesa County Employees' Association (MCEA) hosted a holiday social for all employees Wednesday afternoon at the Mesa County Central Services Building, 200 S. Spruce St.
Perhaps grown-ups are too old for toys, but they deserve holiday ducks, too. 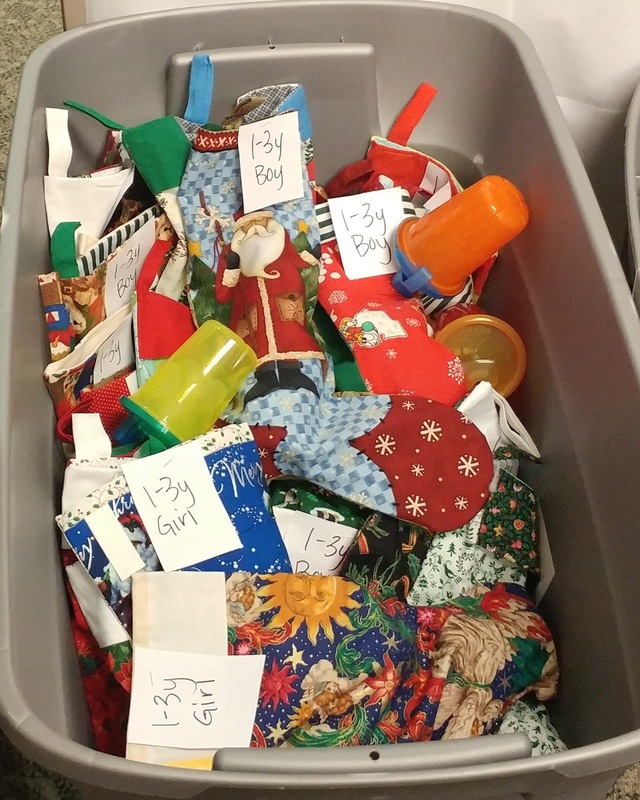 The MCEA for years has kept up with the tradition of providing collectible rubber ducky favors. MCEA members from left to right: Criminal Justice Services Accountant Doni O'Rourke, Public Works OWTS Specialist Jennifer Caldwell, Traffic Technician Tina Dugger, Administrative Assistant Rene Romero and Fairgrounds Manager Donna Redd serve employees at the holiday luncheon. Thank you, ladies, for taking care of a few hundred employees that attended the holiday luncheon! Prime rib, green beans, salad, mashed potatoes, gravy and a dinner roll! A vegetarian entree option was available, too. Oh, my! Apple pie! What’s the best thing to put into an apple pie? Your teeth, of course. MCEA President Lori Seely makes sure everyone turns in their ticket to participate in the raffle. Mesa County Public Works staff members took a break from their busy schedule to sit down and enjoy a warm meal. Great turn out at the this year's MCEA Holiday Social! MCEA members spread holiday cheer and serve employees their meal. 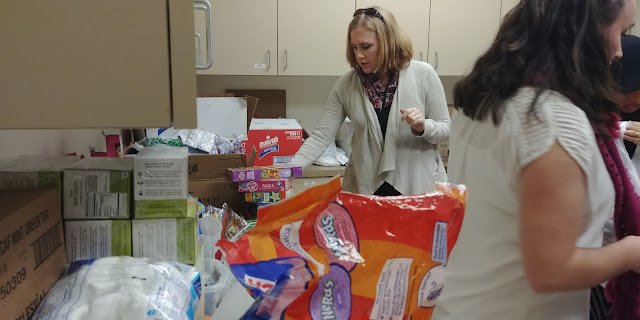 Mesa County Department of Human Services (DHS) Child Welfare Supervisor Crystal Stewart picks out dessert. Mesa County employees enjoy lunch by the virtual fireplace. Mesa County Administrator Frank Whidden and Mesa County GIS Administrator Chris Kadel catch up at the MCEA Holiday Social. Tech talk. Mesa County Facilities crew members Dan Adams, Tim Morfin, Federico Vargas, Christopher Trujillo and Steve Medina socializing at the holiday luncheon. Many Mesa County employees took a break to enjoy conversation and delicious food at the 2017 MCEA Holiday Social. Janika Harris talks on the phone during her time at the holiday social, probably checking in on her new grandbaby! Mesa County Planning Director Linda Danneberger and Commissioner Scott McInnis enjoy lunch and conversation at the holiday social. DHS Operations Supervisor Albin Escamilla and DHS Clerical Supervisor Ingir Beman sit down to eat. Mesa County Information Technology Technical (and "Emotional") Support Specialist Paul Mitts rocks his Hawaiian Christmas shirt at the holiday luncheon. Mesa County Maintenance Supervisor Federico Vargas has two new friends. Sometimes you have to make room for people to walk by. Mesa County Public Works Office Administrator Pam Hawkins, Mesa County Surveyor Patrick Green and Paul Mitts with IT's help desk wear their holiday wardrobe and help spread holiday cheer. DHS Services Operations Supervisor Albin Escamilla, right, tells everyone at the table that Paul, center right, is his friend. But, let's be real, Paul is EVERYONE's friend when having technical difficulties. Mesa County DHS Child Support Specialist Lorri Chavez, Roxanne Delay, and Betty Thomason enjoy good conversation and better company at the MCEA Holiday Social. Mesa County Attorney Patrick Coleman catches up with Commissioner Justman at the MCEA Holiday Social. Nobody likes getting their picture taken while they eat, including Commissioner Justman. To participate in the MCEA Holiday Social employees pay admission by donating to the Bear Necessities Closet and Roice-Hurst Humane Society. Mesa County employees donate hundreds of items to the Bear Necessities Closet, a support program for Mesa County Foster children. Elf on the shelf on a whole other level. The little elf is sitting on the top of Mesa County Public Works-Engineering Department Regulatory Programs Manager Carrie Gudorf's nine-foot straw. The giant straw is used as a prop for stormwater education. Close up of the elf on the nine-foot straw. 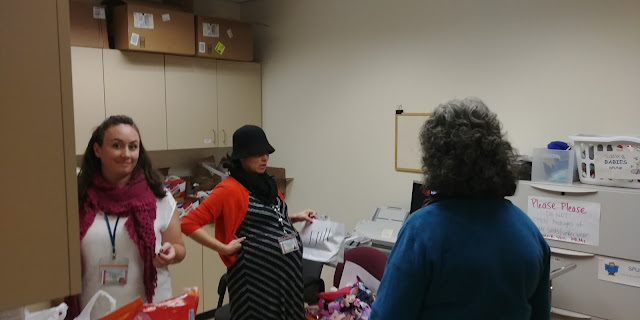 DHS staff members Kate Beltran, Kylie Mayfield, and Lori Rienstra making a list and checking it twice. 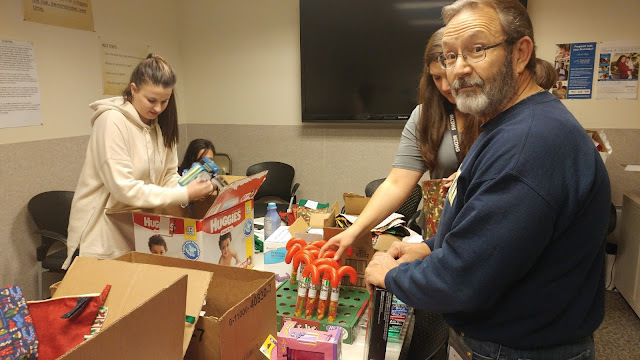 DHS staff members Courtney Thompson, Carrie Hoffman, and Jeff Sheley do the stocking stuffing. Stockings ready for Santa's sleigh. Mesa County Sheriff's Office (MCSO) Captain Todd Rowell, left, Captain Don Hendricks and Sheriff Matt Lewis talk before the Mesa County Sheriff's Office 2017 Awards Ceremony. MCSO Captain Don Hendricks, left, Mesa County Sheriff Matt Lewis and Administrative Assistant Wendy Likes make sure everything is ready moments before for the Mesa County Sheriff's Office Employee Recognition Awards Ceremony got underway. MCSO Deputies present colors during the Mesa County Sheriff's Office Awards Ceremony. Mesa County Commissioner John Justman at the Sheriff's Office Awards Ceremony. Captain Todd Rowell presents an award. Mesa County Commissioner Rose Pugliese and Mesa County Administrator Frank Whidden attend the Sheriff's Office Awards Ceremony Thursday, Dec. 7, 2017. Mesa County Sheriff Matt Lewis expresses his gratitude to employees during the Sheriff's Office Awards Ceremony for a job well done. Deputy Cannizzaro, left, was patrolling the Wild Rose parking lot and noticed two horses with blood on them, then saw nine-year-old (at the time) Andrew Horner, center left, running after them. Horner reported to Deputy Cannizzaro that his grandmother, Terri Wise, center, had fallen off her horse and was badly injured. Horner saved his grandmother's life by notifying Deputy Cannizzaro, who called for medical attention. Wise was flown to St. Mary's after suffering serious injuries. Sergeant Marco Montez, right, was also on scene. Horner was awarded the "Distinguished Service" award during the ceremony at Mesa County Sheriff's Office Thursday, Dec. 7. County Commissioners from across the Western Slope met with the Colorado River District Wednesday, Dec. 6. 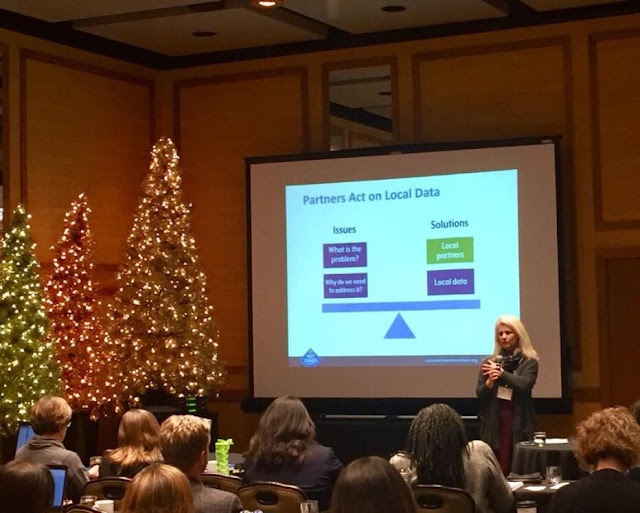 Mesa County Public Health Regional Health Connector Sarah Johnson spoke at the Colorado Health Institute's (CHI) Hot Issues in Health Conference this week. She and Sara Schmitt of CHI presented "Local Data for Difficult Debates: How Graying and Guns Differ Across Colorado" - a session that looked at two case studies to show how local numbers and partnerships are essential to finding informed solutions to firearm deaths in Colorado. On Tuesday, November 7, 2017, the majority of the eligible electors of Mesa County approved a ballot issue to impose a 0.37% (37 cents on a $100 purchase) sales tax to fund public safety functions. This sales tax shall be collected on all sales of tangible personal property and services taxable pursuant to C.R.S. §39-26-104 in the incorporated and unincorporated areas of Mesa County Colorado. The Public Safety Sales Tax shall become effective on January 1, 2018. For the purpose of the Public Safety Sales Tax, all retail sales are consummated at the retailer’s place of business, unless the tangible personal property sold is delivered by the retailer or his agent to a destination outside Mesa County, or to a common carrier for delivery outside the limits of Mesa County. The gross receipts from such sales shall include delivery charges, when such charges are subject to the state sales and use tax imposed by Article 26 of Title 29, C.R.S., regardless of the place to which delivery is made. If a retailer has no permanent place of business in the County, or has more than one place of business, the place or places at which the retail sales are consummated for the purpose of the Public Safety Sales Tax shall be determined by the provisions of Article 26 of Title 39, C.R.S. and by rules and regulations that may be adopted by the Colorado Department of Revenue from time to time. This Public Safety Sales Tax shall apply to mobile telecommunications services to the greatest extent permitted under C.R.S §29-2-105 (1.5). The term “countywide” includes all incorporated areas (i.e., municipalities, including, but not limited to, all statutory cities and towns and all home rule cities and towns) and all unincorporated areas within Mesa County, Colorado. The collection, administration and enforcement of the Public Safety Sales Tax shall be performed by the Executive Director of the Colorado Department of Revenue in the same manner as the collection, administration and enforcement of the Colorado State sales tax, as supplemented by Article 2 of Title 29, C.R.S. At the time of making a tax return of the Public Safety Sales Tax, every vendor shall be entitled to withhold a vendor’s fee to cover the vendor’s expenses in the collection and remittance of the Public Safety Sales Tax in the amount equal to three and one-third percent (3 and 1/3%). If any vendor is delinquent in remitting the Public Safety Sales Tax, other than in unusual circumstances shown to the satisfaction of the Executive Director of the Department of Revenue, the vendor shall not retain any amounts to cover such vendor’s expenses in collecting and remitting said Public Safety Sales Tax. For the 2017 year, the combined sales tax rate is 4.9% for transactions outside the City of Grand Junction limits and 7.65% for transactions within the City of Grand Junction. For the 2018 year, the combined sales tax rate will be 5.27% for transactions outside the City of Grand Junction limits and 8.02% for transactions within the City of Grand Junction. Please see the details of these tax rates in the following tables. The Mesa County Commissioners proclaim Dec. 5 as Grand Valley Gives Day in public hearing and present the proclamation to local non-profit representatives. Today the commissioners declared Dec. 5 as Grand Valley Gives Day in Mesa County and invite everyone to donate to their favorite local non-profit organizations. On Tuesday, Dec. 5, 2017, 33 non-profit agencies will work together to raise over $150,000 to ensure that local nonprofits can continue to provide valuable services to the residents in Mesa County. The Mesa County Commissioners today approved a $165,623,590 county budget in public hearing. The approved expenditures prioritize core services to stabilize programs and services for continued development, design and construction of high priority capital projects that address public safety and infrastructure needs. The total budget for 2018 is $165,623,590, which is a 6.1 percent increase from the 2017 adopted budget. The general fund budget is $56,578,694, which is a 1.3 percent decrease from the 2017 adopted budget. For more information on the 2018 budget, visit https://www.mesacounty.us/finance/2018-budget.aspx. Additional information will be posted online as it becomes available.